Below is the latest news about several smartphones coming to Tracfone in the near future. http://littlebitjohnny.blogspot.com /">TracfoneReviewer strives to share the latest news and information bout Tracfone and we hope you find this useful! 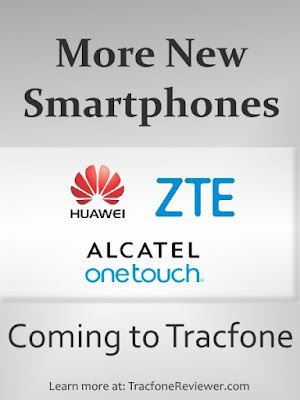 Tracfone is getting busy releasing new smartphones for consumers to use on their prepaid service and we are excited by a number of new mid-level phones by ZTE and Alcatel that will be coming to Tracfone. We've already covered some of the new http://littlebitjohnny.blogspot.com /2016/04/new-lg-samsung-smartphones-coming-to.html">LG and Samsung phones that are coming soon, and some of these phones are already available such as the http://littlebitjohnny.blogspot.com /2016/05/tracfone-lg-treasure-l51al-review.html">LG Treasure, LG Rebel, LG Stylo 2 and others. Tracfone is also releasing a number of different Apple iPhone devices, http://littlebitjohnny.blogspot.com /2016/05/iphone-6s-plus-and-other-apple.html">including the iPhone 6 and 6S. Follow the link to learn about these high-end smartphones. 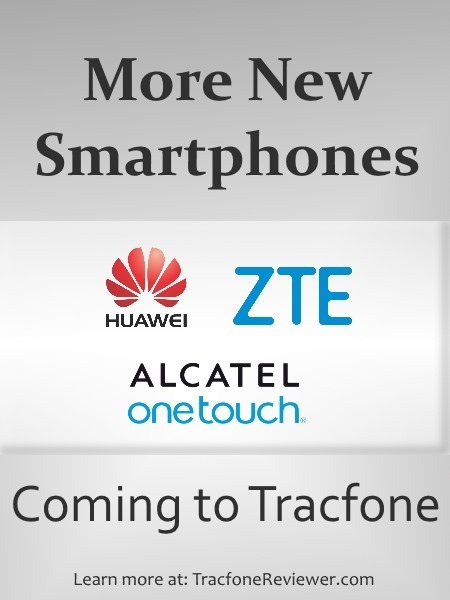 Here we will be sharing news and some basic features/specs about a variety of mostly ZTE brand smartphones, but also some new Alcatel and Huawei (Nexus 6P) devices, that Tracfone will be offering to consumers in the near future. Some of these phones are actually already available, including the ZTE Lever, ZTE Whirl 2, ZTE Stratos and others. Tracfone is offering these smartphones through several different channels, with some phones only available on the Tracfone website, others through retailers like BestBuy and WalMart, and a number of Devices only available through HSN.com. ZTE, Alcatel and Huawei are all Chinese mobile phone manufacturers, with each one offering a wide range of devices. Some of the phones below are very inexpensive, but don't have great features. But several devices do look quite good, and come at a reasonable price. Let's take a look. We will look at each of the new phones, listing some of the key specs and features and information about availability. The Scend is a GSM device that comes with a 4.5" screen, Android 4.4 and 4G connectivity. It isn't overly exciting, but should be available for a reasonable price. It appears to only have about 2 GB usable memory, which may be a serious drawback for some. Availability: Briefly available from various retailers, current availability unknown. Featuring only a 4" touchscreen, the Citrine makes up for it with Android 5.1, 4G LTE, quad-core processor and 8 GB internal memory. It uses GSM networks, which will be AT&T through Tracfone. Compared to the Scend, the Citrine is better in just about every way if you don't mind the smaller screen. It is also currently available for just $29 through Tracfone. There will also be a CDMA version of this phone, the Z717C. Availability: Currently available from Walmart for $49 or available from Tracfone for $29. Will likely be available from other retailers as well. Here's a phone that caught our attention, the ZTE Lever. It has a large, 6" touchscreen, 16 GB internal memory, an 8 MP camera, and uses CDMA technology. The only drawback is that it appears to run the older, Android 4.4. The Lever is retailing for $179, which also includes 1200 minutes and other add-ons. If you're looking for a large screen, this has pretty good bang for your buck. The other option might be the LG Stylo 2 which was just released (also on HSN) and has a 5.7" touchscreen. Availability: Currently available from HSN.com for $179 with minutes bundle. The Paragon comes with a 4" touchscreen, Android 4.4 and a 5MP camera. Most of the features on the Paragon are not overly exciting, and it is similar to the ZTE Scend. The Paragon is the GSM version of the ZTE Zypher, which was released in 2015 and we already reviewed. Go check our review if you want to learn more, the only difference between these phones is which network they will use (CDMA or GSM). Availability: Currently available on the Tracfone website for $29.99. Another Budget friendly smartphone, the Whirl 2 comes with Android 4.3, a 3.5" touchscreen, and 3 MP camera. None of these features are all that impressive, but it does have a quad-core 1.2 Ghz processor. This smartphone has one of the smallest screens, but might be a good option for those who just need a phone for making and receiving calls. It is hard for us to find a reason to recommend this phone, other than the fact that it is small. So if you really want a small device, this could be an option. But at $40, there are several phones that are slightly better for a similar price (the Paragon listed above), or some phones that are better for a little more money (like the ZTE Stratos below). The Stratos is a phone we really like, because it has enough 'good' features that will make it very usable for most people, while still available for a good price. What kind of features? Well it comes with a 5" touchscreen, Android 5.1, and a 5 MP camera. The Stratos also has 8 GB internal memory and has 4G LTE using CDMA networks. The ZTE Stratos is currently on sale for $79 from HSN and comes with 1200 minutes - worth $100 by itself. If you're really interested in this phone, you should act quickly, as the price will probably go up to $99 soon. The ZTE ZMAX 2 is another smartphone that comes with some great features. It has a 5.5" touchscreen, Android 5.1 and an 8 MP camera. It uses 4G LTE through GSM networks and has 16 GB internal memory. It is a bit more expensive than the Stratos, listed at $149 with airtime bundle from HSN, and it is currently out of stock. But it should be for sale again soon. The Pixi Eclipse has a 4" touchscreen, Android 4.4 and a 2 MP camera. It is a budget friendly phone that is low on any exciting features. For most people, some of the other more powerful phones listed above, will probably be a better option. Availability: Currently available on the Tracfone website for $39. There are several other Alcatel smartphones that appear to be coming sometime in the near future and have better features. We will update as we learn more. Here's a phone some Tracfone customers will be very excited about. When we first saw this phone listed on the Tracfone tutorial site, we didn't recognize it because it was listed as the Huawei H1511DL. But after some quick digging we realized it was the Nexus 6P. You might be asking, so whats so special about the Nexus 6P? Well, it comes with a number of great features, like a 5.7" touchscreen, 12 MP camera, 3 GB RAM, and much more. It is also special because Huawei made the phone in a partnership with Google, and Nexus phones generally come with less pre-installed apps and other annoying things. All this will likely come at a cost, and we suspect the Nexus 6P from Tracfone will be listed for somewhere around $500. If you really want this phone with Tracfone, but don't want to pay the price they will charge, you might be able to find refurbished options for less, and bring it to http://littlebitjohnny.blogspot.com /p/tracfone-byop-phone-list.html">Tracfone's BYOP program. Availability: The Nexus 6P is currently not available from Tracfone, but we will update as soon as more news is available. That concludes this list of phones coming soon, and already available. We will be working hard to continue updating with the latest news and details. Check out our recent list of http://littlebitjohnny.blogspot.com /2016/06/tracfone-discounts-and-sales-june-2016.html" target="">Deals, Discounts and Sales on Tracfone Devices, which also included some great deals on BYOP compatible phones. Join nearly 2000 others and follow us on Facebook where we are most available for questions and post news, info and tips. Thanks for visiting, leave a comment below to share your thoughts on these new smartphones! You have finished reading New ZTE and Nexus Smartphones Coming to Tracfone and many articles about Tech Gallery in our blog this, please read it. and url link of this article is https://littlebitjohnny.blogspot.com/2016/07/new-zte-and-nexus-smartphones-coming-to.html Hopefully discussion articles on provide more knowledge about the world of new tech gadgets.